The beat plays on for housing sales. 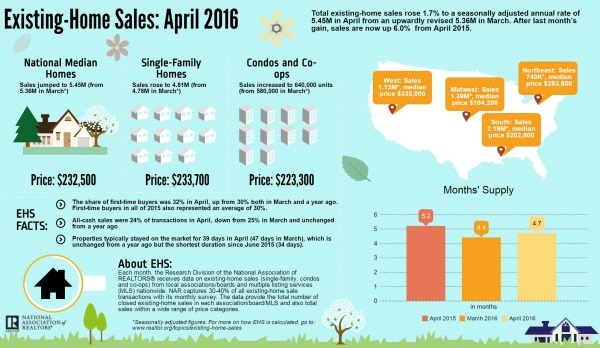 Numbers for existing home sales – as reported by the National Association of Realtors every month – continued to show the strength of the American housing market in April 2016. I’m starting to sound a bit like a broken record. Despite the strong numbers, we would have seen even better numbers if the inventory was available to buy. The good news is that both building permits, housing starts and new home sales numbers showed increased activity in adding that inventory finally. Sales of previously owned houses in the United States increased 1.7 percent to in April, following a revised 5.7 percent gain in March. The numbers beat expectations of 1.3 percent too. Condominium sales were especially strong – jumping 10.3 percent. The average price rose 4 percent and the months’ worth of supply went from 4.7 from 4.4. That’s a 6 percent increase from last year. Despite ongoing inventory shortages and faster price growth, existing-home sales sustained their recent momentum and moved higher for the second consecutive month, according to the National Association of Realtors®. Lawrence Yun, NAR chief economist, says April’s sales increase signals slowly building momentum for the housing market this spring. 45 percent of homes sold in April were on the market for less than a month – homes are moving fast. Great news for sellers, but it’s making life tough for buyers. Keep your head up buyers, the pain is universal and is slowly easing. Don’t expect to be one and done on an offer though, you’ll need to move quick, have a strong offer and an even stronger mortgage pre-approval. Seriously, go through underwriting before you even attempt to make an offer. You’ll significantly cut your time needed to close and put your best foot forward for the seller. Strong pre-approvals mean strong buyers and quicker escrows – a seller’s dream. “Looking ahead, with demand holding steady and supply levels still far from sufficient, the market for entry-level and mid-priced homes will likely continue to be the most competitive heading into the summer months” says Yun. The other good news came from the first-time buyer demographic – they finally increased their market share. After hovering near 30 percent for months – well off the historical averages of 40 percent or more – first-time represented 32 percent of the market in April. More Millennials still need to jump into the market though, time to make the plunge already. The Northeast showed a 2.8 percent gain to an annual rate of 740,000, and are now 17.5 percent higher than last year. The median price in the Northeast was $263,600, which is 4.1 percent above April 2015. The Midwest performed exceptionally well with existing-home sales skyrocketing 12.1 percent to an annual rate of 1.39 million. That’s up 12.1 percent above April 2015. The median price in the Midwest was $184,200, up 7.7 percent from a year ago. The South lagged some in April, existing home sales were down 2.7 percent to an annual rate of 2.19 million in April, but are still 4.3 percent above April 2015. The median price in the South was $202,800, up 6.5 percent from a year ago. Sounds like the West Coast is not the only region suffering from inventory issues. Out West existing home sales sank too, but not as much as the south and mostly due to the previously mentioned lack of inventory. They decreased 1.7 percent to an annual rate of 1.13 million in April, and are 3.4 percent lower than a year ago. The median price in the West was $335,000, which is 6.5 percent higher than last year. Pretty much illustrating our point. All in all the market remains strong and the summer 2016 buying season could easily be one of the best in recent history IF the inventory is there. Sellers are virtually assured to enjoy the market unless builders cracking on single family residence construction quick. Build it and they will come – in droves apparently.